I have a little contest for you - my money grubbing, scrapbooking, spend-a-holic friends. Many of you know I'm headed to Los Angeles in a mere six days for a week long break and fun with my Yahoo friends on the Scrappin' Scruds group. I've been "scruds" (scrappin' buds) with some of these ladies for nearly seven years now! This is my 3rd retreat in a row and I'm nearly beside myself with excitement. I'll miss my family for sure - but will be revived and ready to tackle the job of motherhood with full steam when I return. Anywho... back to my contest. 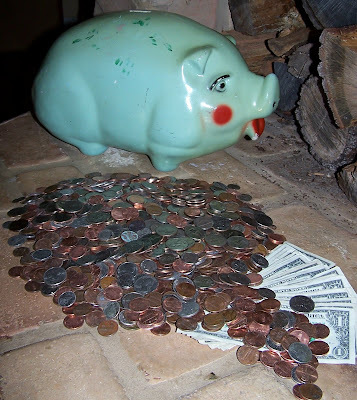 I've been saving my pocket change and small bills off and on for almost a year in my green pig. The green pig was my mother's, I believe, and he sat on the floor next to the china cabinet at my gramma's house since before I ever was. I've been dropping coins into him ever since I could clutch and release them. He was also good for the occasional "ride". When it was time for me to get married my gramma had us empty him out and we used the money to buy bridesmaid and flower girl dresses for my cousins to be in our wedding. Soon after I was married the green pig became my prized possession. He has had a place of prominence in my home ever since. I don't even know how much is there myself... I just loaded it up in a gallon sized Ziploc and took it to the bank. They're sending me a receipt of deposit - probably in tomorrow's mail. No fair - I'm getting a red x - will try later! I'm going to guess about $50. Way to go, Sara. I'll guess 37.50. I'll guess you saved about $72.00. Cute piggy! Can't wait to see you next week! I am going to guess $97.58. But I hope for your sake, it is MUCH more! I'm guessing $59.00, but I really hope it's more! "Everything's Better with Blue Bonnet(s) on it"